One of the rewards of playing soccer stem from working hard at a tactic in practice and then successfully using it in a game. Players of all ages, from under-16 to kindergarten, can learn a lot from this process. One such tactic, called the fast-break, can be one of the more exciting and productive skills in the game. 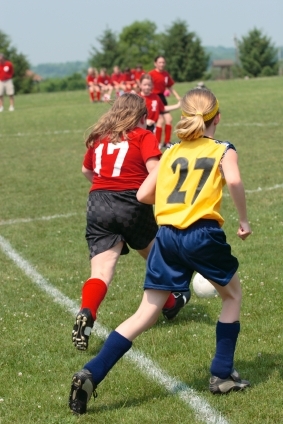 Switching from defense quickly to a counter-attack involves a complete team effort. Like all team tactics, the fast-break is a combination of several skills which must be practiced in order for the move to work as a whole. High on the list of skills needed in this case is the ability to pass the ball accurately over long distances as well as the ability to make a run onto the pass at precisely the right moment. These skills can be practiced anywhere and all that’s needed are two of your players and some space on the field. Begin by having them stand about thirty yards apart and pass the ball to each other. Of course, shorten the distances for younger players. They should concentrate on driving their passes so that they go crisply to each other. It’s best if passes don’t bounce along the ground. When the ball is received it should be controlled and the players should look up and drive it back again. When they’ve become proficient at doing this, one player should play the ball to a spot twenty yards or so to one side of the other. The point of this aggressive soccer drill is for the player and the ball to arrive at the spot at the same time. If the one player arrives and needs to wait for the ball to come he’s made his run too soon. In a match he would be quickly marked by defenders if he did this. If he arrives too late, he’ll miss the ball. It’s all dependent on judging when the player with the ball is going to release his pass. At the same time he needs to be consistent in the strength of his passes and continue to drive them rather than lightly pass them. Practice this, taking it in turns having one playing the passes and the other running to meet them. When your team has worked on these skills you can put that into practice in team training routines designed to encourage the fast-break. It’s not always possible to hit long passes deep into space behind defenders. The defense will usually retreat quickly to fill these spaces. But your player can still break quickly if the ball is played up to the feet of a front player. He can then either turn and run at the defenders with the ball or play it back to a supporting player. The supporting player then plays the ball through for a return pass to a forward or passes to a third player running through. Again, as your team grows in confidence, you can make the practice more difficult by introducing defenders. If you work at this skillset, your team will be well-equipped to launch counter-attacks whenever your side gains possession after your opponents have attacked in force. Remember, once your team has the ball and is breaking forward, the whole team must make every effort to help the player who is making the break.